Become a Sponsor Today of the 2018/19 Season! Download the Sponsorship form HERE and submit HERE. Creative Cauldron has spent over 15 years building a solid reputation in Northern Virginia and has become a trusted part of the Falls Church community. The 2018-2019 Season will be our 10th production season at ArtSpace Falls Church. Sponsorship of our season provides the opportunity for your business to build positive connections, attitudes and values in the minds of its customers as well as linking your business with innovative and creative thinkers. All sponsorships include advertising in our programs and the ability to display your promotional materials in our lobby. 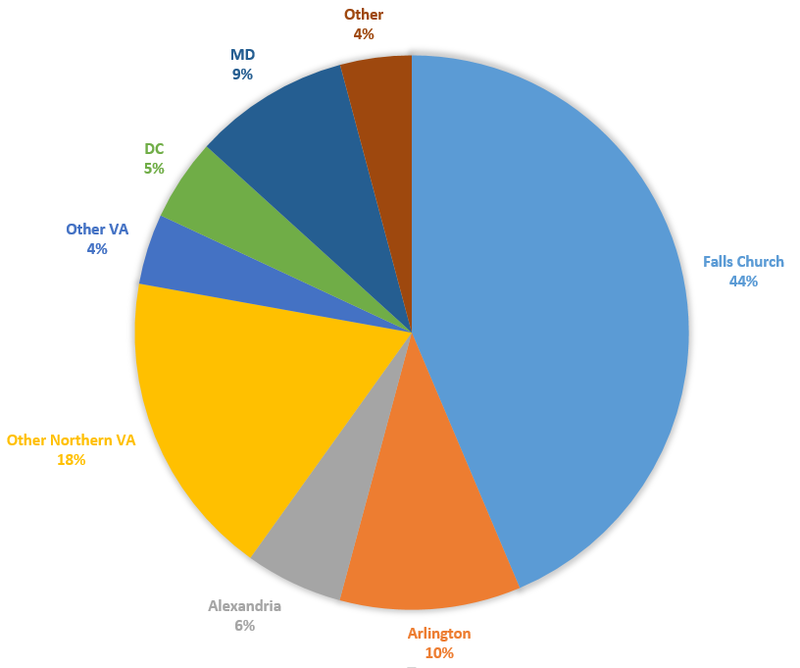 Creative Cauldron produces nearly 200 performances and serves over 15,000 patrons annually with almost 80% of our patrons local to Northern Virginia, as seen in the graph. These patrons shop, dine and spend locally with companies just like yours! Creative Cauldron deeply appreciates the support of area businesses like you.